Like everything else in Dart, numbers are objects. In fact, numbers are specified as interfaces. Numbers come in two flavors in Dart: integers of arbitrary size and decimal 64 bit doubles as specified by the IEEE 754 standard. Both int and double are subinterfaces of num. 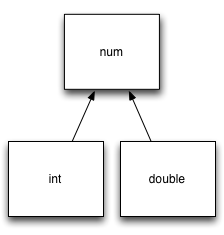 num is the supertype, int and double extend num. The num interface defines the basics like +, -, /, and *. Num is where you'll also find abs(), ceil(), and floor(), among other methods. You may also specify hexadecimals with the 0x prefix. You might see Dart code that explicitly adds a + prefix to the number, though it isn't necessary. If the number includes a decimal, it is a 64 bit double that follows IEEE 754 standard. The num interface provides a simple check for isNaN(). A common requirement is to turn a number into a String, or a String into a number. Attempting to format a string that isn't a number will throw a BadNumberFormatException. Going the other way, converting numbers to Strings, is also very easy thanks to toString(). A potentially unfamiliar change is the methods like ceil() and abs() are found on the num interface, and not in Math. Dart supplies a num interface with two subinterfaces: int and double. Integers are arbitrary precision, meaning they have arbitrary size. Doubles are 64 bit decimals that follow IEEE 754 spec. Read more of my Dart posts, try Dart in your browser, browse the API docs, or file an issue request. Dart is getting ready, please send us your feedback!